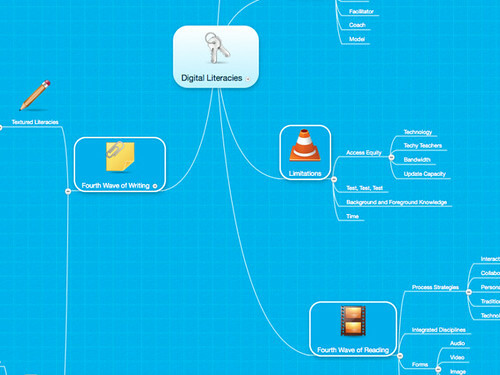 One of the two online inquiry groups I am participating in at the P2PU is all about writing and literacies in a digital age, and one of the participants has been sharing a conceptual mind map that she is working on around her own conceptions of digital literacies. The map is changing as our conversations grow, but I like the logical approach and I also like how the map is still underway and in the midst of change. It’s worth your time to see what Sheri Edwards is up to with her map, and for us to think about: what may be missing, and what do we see on her map that overlaps with our own understandings.